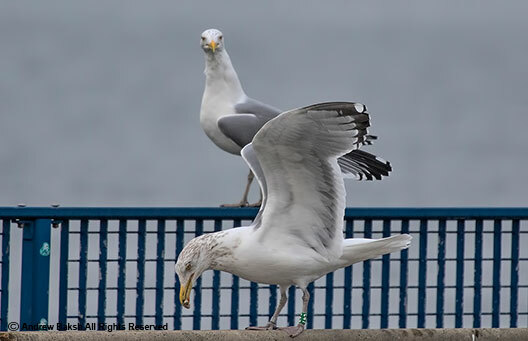 Herring Gull C47 showboating for nearby Herring Gull 2-15-2018. 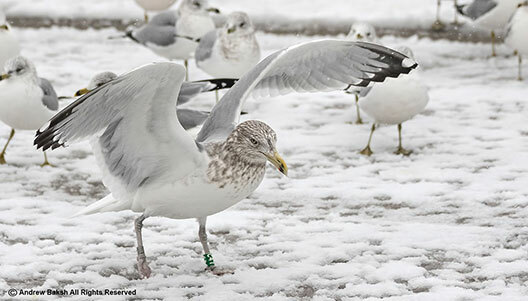 Over the past few seasons, I have become quite familiar with banded Herring Gull C47 who has made Brooklyn one of its favorite wintering sites. I have had countless encounters and taken many photographs. 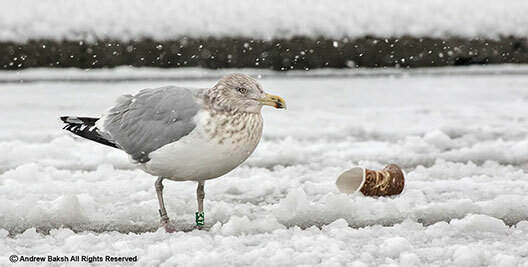 This bird was banded by Dr. Sara R. Morris in 2005 at Appledore Maine when it could not fly. In 2017, it was in its 13CY (calendar year). My last observation was on 2-15-2018, where I watched it interacting with Fish Crows as they appear to have devised a plan to extract treats from a nearby garbage can. Some photos C47 from this Winter. 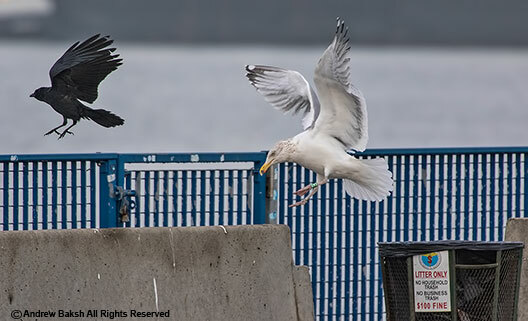 Herring Gull C47 negotiating with a Fish Crow for scraps 2-15-2018. The listserv is dead, long live the listserv! When older birders wax on about the methods used to report Rare Birds and how such information was shared with the wider birding community years ago, I am fascinated. How on earth did people manage to twitch rare birds in a timely manner? Some stories go so far as to suggest that one only found out about a good bird sighting if you were in the know. Meaning, one had to have the proper connections, was on "the list" or whatever terminology was used back then to suggest that you either qualified (whatever that meant) or lucky enough to be told of a rare bird that showed up. I often wonder, if the lack of technology to disseminate information to a wider audience, then led to the creation of so-called cliques resulting in whispers of secret groups with names like "elite birders" a result of where some felt slighted that birds were only shared with a select few, not with everyone. In the "good ole days" as some refer to that time, people waited as much as an entire week, perhaps even longer to learn about some rarity in the area unless you were "in the loop" and got that coveted phone call. Today, birders have a plethora of tools to share information about birds. The main repository of bird reports these days comes from listserves. If you are not yet aware, a listserv is an application that distributes messages to subscribers on an electronic mailing list. It uses what is referred to as pull technology, meaning a user would have to either go their e-mail inbox to read messages that were posted. The listserv became the one stop shop for all birds reported with many states carrying multiple lists that covered various regions within that state. New York, for example, currently have 8 lists covering various regions. The ABA (American Birding Association) website now has links to reports from all the states on one page. It is easy to visit their website to get the most recent reports. Note, these lists are only good if they are populated with updated and relevant information. Not long ago, there were several posts on the NY Listserv, pleading for bird reports. As a result, I began to take a closer look at how birds were being shared by birders today. Many birders who I spoke to have decided that the listserv is all but dead. They cite other resources such as eBird (an excellent tool used to gather and store data on birds observed) under the assumption that once they submit a checklist with their birds, that checklist information, is readily publicly available. eBird with the exception of a checklist with either hidden values or entries that need further documentation for validation I believe is usually updated on an hourly basis for a given checklist to become public data. This means that eBird reports are not really readily available for public consumption. This is a problem for some birders because we are in an age of instant gratification. The people demand their bird notifications promptly and often. So some birders have turned to other tools in the hopes of getting information in a timely manner suited to their needs. In addition to using eBird, birders have also resorted to using other methods of sharing information, such as text messaging and using various social media tools like Facebook and Twitter to name two. The latter is mostly used to send short messages about a bird (s) to those people who follow that twitter account. Hashtags associated with that account are used as a way to reach a wider audience. Then we get to Facebook, which has become quite popular among newbies and some experienced birders. Other messaging tools like WhatsApp, popular in Asia have also found its way into the birding world among North American users. With all of these tools, one would think the information is readily available to all or most. Not so fast. These tools while easy for some might be difficult for others for a variety of reasons. More importantly, I have found that many users will not crossover - meaning Facebook users may not use Twitter, text messages will not make it outside of the recipients and we end up with stovepiping. The end results are that there are often reports that never make their way to the wider audience until it is too late. This has frustrated many and once again, we are faced with the dilemma of data not being made available to everyone in a timely manner. Sounds familiar? Some birders really do try their best to post across platforms but in the end what we see happening is a complete breakdown of how information is shared. Meaning, we are right back where we started; reports of birds are not shared with the wider audience despite all the advances in technology used in getting data out faster. This brings me back to the listservs. Despite the fact that this is a pull vs push technology, the listservs continue to remain a reliable source of information that can reach a wider audience. If those of us who use more of the modern push technologies take the time to share our sightings to the listserv, we would ensure reaching a wider audience thus enabling more to share in our discoveries. The life of Listservs depend on the users and we should share our data or suffer the consequences of a "communication breakdown." Long live the listservs!